No visit to Sweden is complete without a visit to beautiful Gothenburg – Sweden’s second city and the famous Gothenburg Museum of Art. Visitors that have already explored Sweden’s ancient capital and toured the islands on a Baltic cruise from Stockholm should head west to the stunning old university town of Gothenburg for its art, culture and breathtaking scenery. Gothenburg is a large city with lively picturesque streets leading to the waterfront where great green parks look out to isolated islands. The highlight of any visit to Gothenburg is a visit to one of its top attractions: the Gothenburg Museum of Art (Goteborgs Konstmuseum). The Gothenburg Museum of Art is located centrally at the end of the main city street Kungsportsavenyn. It is an imposing, monumental structure with massive archways that dominate the yellow brick front of the museum, and there is a large paved plaza in front providing ample opportunity for photographs. The building was created in 1923 by Swedish architect Sigfrid Ericson in the Neo-Classical style of Nordic Architecture. Once inside, the space opens out to six floors of cavernous great tiled halls. The rooms feel bright, light and airy, and the art inside is displayed appropriately and in its best light. There is an excellent café as well as a cloakroom for visitors. The main draw for the visitor is the art – and there is a lot of art about which to get excited! Although the museum is misleadingly known as a ‘Fine Art’ gallery, the collections are much more diverse than that title would suggest: from classical art of the 18th and 19th century right up to contemporary art from around the world. The museum holds the world’s finest collection of 19th Century Nordic art, including such names as PS Kroyer, Carl Larsson, Edvard Munch, Anders Zorn and Bruno Liljefors. 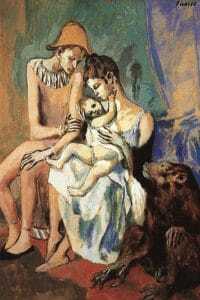 Some marvelous 20th Century art from around the world includes Picasso’s Acrobat’s Family with a Monkey and works by Braques and Chagall. In particular, the Sculpture Room is worth a visit. It is a breathtaking space containing important works by Cajsa von Zeipel and Alexander Calder. Other big names in the world of art include Van Gogh, Monet, and Cezanne – it’s an art lover’s dream. To navigate the museum requires at least half a day to see all of the marvelous art inside. If you plan to visit Sweden, make sure that you visit the Gothenburg Museum of Art. It’s a great example of what the Scandinavians do so well: culture and architecture.